The RS-21 (polyurethane rubystick swabs) also known as Mimaki SPC-0386 Cleaning swaps is the only genuine ruby stick swab in the USA. The ruby stick swabs (Brother GTX Cleaning Stick), made of porous fiber allow for extreme absorption of cleaning fluids, dust and debris. Rubystick (R50 SB7008001) head is slant. Because of this angled head, the stick can fit into tight places. In addition, the Rubystick head is heat, mild solvent and corrosion resistant. These polyurethane rubystick cleaning swabs are NOT imitations. In addition, they are NOT foam swabs that break and rip. Note the head of the ruby stick is made of dense polyester fiber and not rubber. There is NO absorbent rubber. The Mimaki SPC-0386 polyurethane rubystick swabs are also known as Brother GTX Cleaning Stick or T-21 Cleaning Swabs. These swabs are very absorbent and smooth. rubber cleaning stick. Boston Industrial Solutions is the only reseller of the ruby stick swabs. 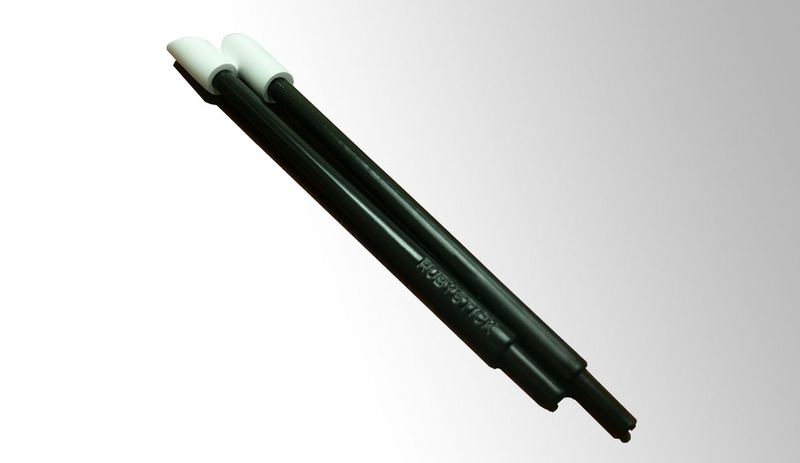 The GTX Cleaning Stick/ Part # SB7008001 is ideal for cleaning many industrial inkjet printheads. Many OEM recommend the ruby stick for cleaning print heads. Inkjet printer print heads from from Kyocera, Spectra, Konica-Minolta, Mutoh, Roland, Brother, Kornit, Epson, HP, Cannon, Mimaki, Inkcups, Engineered Printing Solutions (EPSVT) etc. are all use the Ruby Stick for cleaning. Also, direct-to-garment inkjet manufacturers are now recommending Rubystick to clean printheads. The printers are Brother Part # SB7008, Brother GTX, Brother GT-3 GaffiTee, GT-541, GT-782, Brother Part # SB7008001, Epson F2000 Series, Kornit, Aeon and all other high speed graphics inkjet printers. The ruby stick / GTX Cleaning swab (R50 SB7008001) can be re-used. The head of the ruby stick can be easily removed. It can also be easily replaced. To save cost, we recommend buying an extra head for every 1 Rubystick. Doing so, give you double use for the ruby stick and cuts the cost. Ruby sticks should never be overused. Using Rubysticks too many times will contaminate the pure head. Ruby Stick is also called GTX Cleaning Stick. GTX cleaning stick absorbs ink from the print heads. To change a ruby stick head you need to wear gloves. This will make sure that you do not contaminate the rubystick swabs head. Simply pull the dirty heads from the ruby stick. Replace the head of the ruby stick with a new head. The Ruby stick (GTX Cleaning Stick) is the only genuine ruby stick swab in the USA. It is made of a porous fiber not rubber. This fiber allows for extreme absorption of cleaning fluids, dust and debris. The rubystick swab features a signature slant head. Because of the angled head, the stick can fit into tight places. In addition, the Rubystick head is heat, mild solvent, and corrosion resistant. These are the reasons many inkjet OEM recommend the ruby stick for cleaning print heads. These polyurethane rubystick cleaning swabs are NOT imitations. 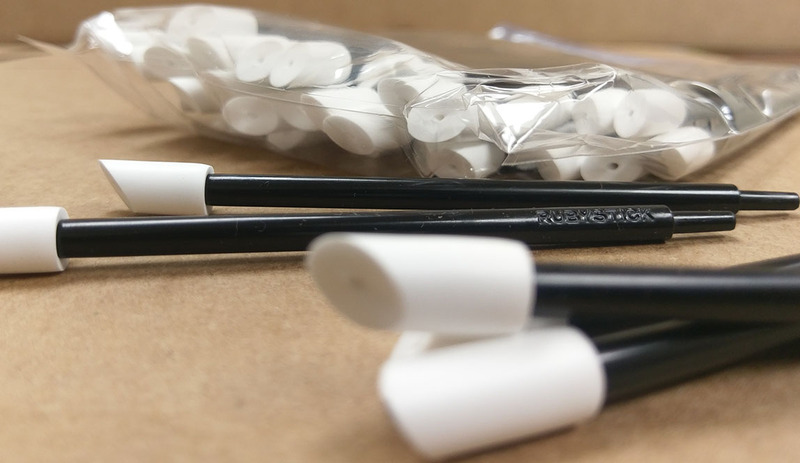 You can use the swabs to clean inkjet print heads for Kyocera, Spectra, Konica-Minolta, Mutoh, Roland, Brother, Kornit, Epson, HP, Cannon, Mimaki, Inkcups, Engineered Printing Solutions (EPSVT), Amica Systems, etc. Call us +1 (781) 281-2558 or contact us for more information.